You’ve tripped into history and fallen straight into prehistoric times! Hordes of powerful dinosaurs present a constant threat to your time machine. Just one rogue reptile could render your machine useless and ruin your chances of ever returning home! But to be armed with knowledge is to be armed and very dangerous. Build towers, collect resources, and use the power of science and technology to win the uncompromising battle for survival of the species! Find out who’s stronger—the technology of the future, or brute force! Original opponents and fearsome bosses await! 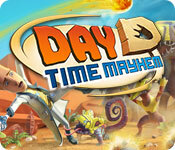 Day D: Time Mayhem is rated 2.6 out of 5 by 11. Rated 5 out of 5 by Sherrill from Excellent Tower Defense! I loved this game - the strategy needed to pass certain levels was fun rather than frustrating for me. I wish there were more like this game! Great graphics and have replayed this a few times now. Not sure why it got such bad reviews, I think it's great! Rated 5 out of 5 by DrDavid from A tower game I think will be a winner Another 8th Floor game has arrived. If you liked Fort Defense and Fort Defender and Royal Defense, then you will like this game. Conversely if you did not like those games you should probably avoid this one. No secret that I liked this games predecessors. 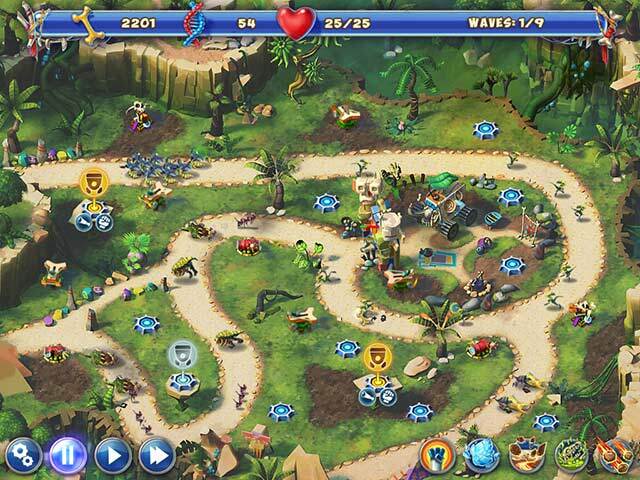 It is played in the same way, using the same type of strategies and towers and enemies but with a different theme. This time the enemies seem harder to see and distinguish, even with my new glasses, but the basic game play will be familiar to you. Somehow I lost on an early level because I did not have enough ‘gems’ which is DNA in this theme, but partly I was distracted by laughing and missed the fact that I had enough money to buy tower upgrades and did not do so in a timely fashion. So I replayed that level. The dinosaur theme is humorous. I think this game is going to be another winner. It won’t be easy to win, but it should be as much fun as the previous games from 8th Floor. Rated 5 out of 5 by pennmom36 from Jurassic Tower Defense If only this game had better graphics! I love the dinosaurs, quick runners but easy to kill, slow and steady but harder to kill. This Tower Defense game still has all the usual features, you are defending a time machine instead of a castle but you still choose which weapon to construct on a tower platform. I liked the feature that some of those fast running dinos split off from the crowd and were able to take short cuts along the path, an unexpected attack! Another feature I liked was the fact that midway through a wave a second group of dinosaurs would start coming out through a second entrance which really makes you have to pay full attention throughout. 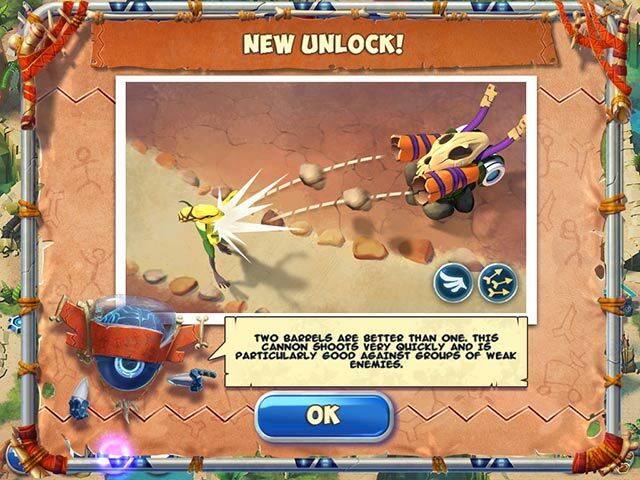 With the dino bones you collect i-volve points to purchase weapons upgrades or even health for your Time Machine. I love the game, love the concept but I think they could have done a better job on the graphics, enjoy! Rated 4 out of 5 by sparkynugget84 from Easy mode is definitely not easy! I've never played a game like this one before, and it intrigued me. However, I'm only to the 12th level of the "easy" challenges and I'm having a difficult time getting 3 stars. Typically, puzzle/strategy games are my favorite because I like the brain workout, my brain is tired playing this one! I'd definitely recommend if you like this type of challenge. Rated 2 out of 5 by Steamed from Hogtied I have started this game over three times trying to buy a better combination of upgrades. Nothing works. I can't get any farther than Level 15. I hardly ever buy a game anymore due to being out of work, but the demo was fun and I thought it would be worth it. Boy was I wrong. Rated 2 out of 5 by jellypuppy from Done much better before 8 Floor Games has made several games in the tower defense genre and, if you enjoy this type of game, I suggest you pick up one of their other titles. 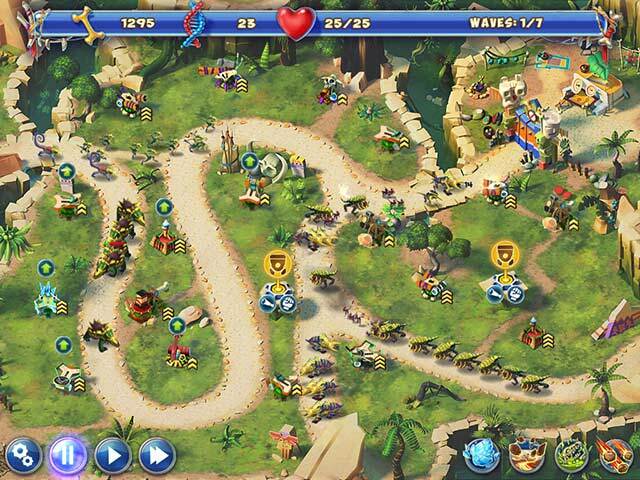 Past games gave you the ability to replay levels for additional items needed to upgrade your towers. In my opinion, that was the best feature of this developer's series as players of all skill levels could upgrade to the point that they needed to progress through the game. Now points needed to upgrade are tied to your success on the levels. When you start having difficulty with levels, you will be further penalized by being given fewer upgrades. Bottom line, this game feels like it is meant for phones where you are solicited to purchase upgrades. As a PC game, it has limited options which equals limited fun. Check out the old Royal Defense titles for a nearly identical experience that is made for PC. Rated 2 out of 5 by tailswhiskers from They missed on this game I tried to play this game, but I did not like it at all. The instructions were not that clear. I had to quit after a few mins. I do not recommend this game. Rated 1 out of 5 by kateblue222 from Couldn't figure out what to do even with tutorial on, and when I restarted, no more tutorial. It said something about "Defenses can be built in places like this." but then I kept couldn't figure out how to build the defenses. I clicked nearby and then something would appear and disappear. Finally, I restarted. The tutorial was gone. When I clicked near where it had been, I got some sort of a gun thing that shot at passing dinosaurs. But it had three sets of icons around it when I clicked on it. I think they were some sort of choices, but since the tutorial disappeared when I restarted, I still could not figure out what to do. Music was thoroughly annoying, too. Plus, in the real world, people and dinosaurs did not actually exist at the same time. And the "storyline" (there was none) did not rationalize this point. Deleted. Rated 1 out of 5 by SharkiB from If you liked the other 8-Floor games in this genre DON'T BUY THIS ONE. I bought every single one of the other defense games by this developer and had tons of fun and hours of gameplay. I bought this one assuming it was a new twist - and boy is it ever - but not in a good way! The other games were a bit of a grind sometimes in order to get the coins needed for upgrades, but were worth it in the end when you could finally get that "perfect" score on hard levels! This game has no such mechanic - the i-volve currency needed for upgrades is a one-shot only deal per level, and if you buy much needed tower real estate you're done for. It's a game with potential but the devs fell flat on their face with this one - with no way to improve or get forward it's just stopped being playable on about level 15. Rated 1 out of 5 by graceland9 from Please allow level select for Mac version This is the second 8 Floor game in a row that doesn't work properly on a Mac. The last, Iron Sea Defenders, got stuck halfway through the second half because of graphics, and all the suggestions the tech wizards at Big Fish gave me didn't work. Now the Mac version of Day D is auto set to the Hardest mode, which makes it impossible to pass by level 15. IMPOSSIBLE. Too bad, because I really enjoy tower defense and 8 Floor's were fun to play. Not any more though, due to shoddy development and poor coding. I've read a lot of reviews on this site that say the exact same thing happens to Mac users. Unfortunately, despite being a fun game with a cool storyline, the massive glitch makes me say: Do NOT buy if you are a Mac user.